Jaw slit systems available (with UHV-Feedthrough, Type LM 17) are used for beam size limitation, beam analysis functions, and energy definition in beam transport systems of particle accelerators. The slit-jaw system pictured below, consists of a cooled copper block which is covered with a tantalum plate. 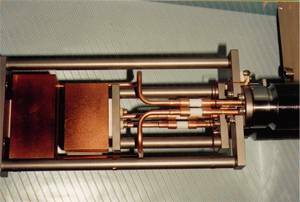 To facilitate good heat conductivity between copper and tantalum, a special vacuum braze has been chosen (SCP 3 AT, 930°C Degussa). To avoid tension between Ta jaw and Cu body components, a thin copper plate has been placed between the jaw and the body of system. Again, a special braze (UH 720 Degussa) has been used for joining of the Cu body to intermediate components manufactured from stainless steel and ceramic feedthroughs with copper or Vacon fittings.